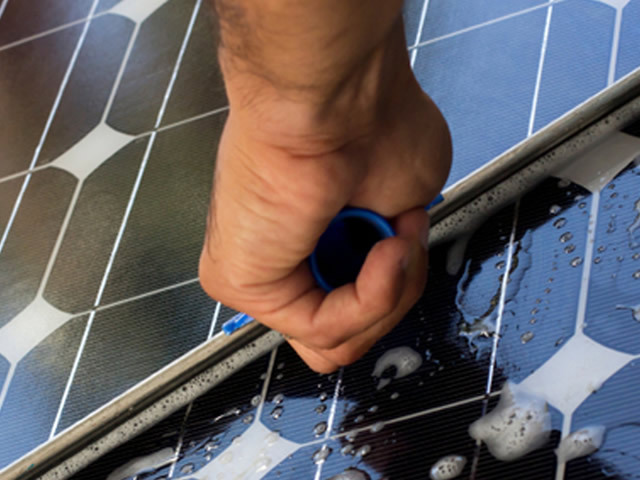 A solar power system will generally not need much attention when it comes to maintenance, however some simple care like solar panel cleaning and a visual inspection of the hardware once in a while is good practice to help keep your system operating trouble-free. A solar power system when adequately installed should provide years of trouble-free performance. However, any system can occasionally fail or not perform to its optimal output. As a solar power system owner, you have two options when it comes to maintenance. The first option is to do nothing and let the system fail; this can be costly and inconvenient. The second option is to be proactive and spend a relatively minor amount of your time at least once a year is making sure your system and solar panels are safe, clean and operating at their peak performance. The first point to make here is that safety should always be your top priority, solar panels are an electrical appliance. Therefore, the same safety precautions and laws apply to solar panels and associated cabling and wiring as do to the wiring and electrical appliances in your home. Only a fully licensed electrician can make repairs to high voltage electrical wires and devices. 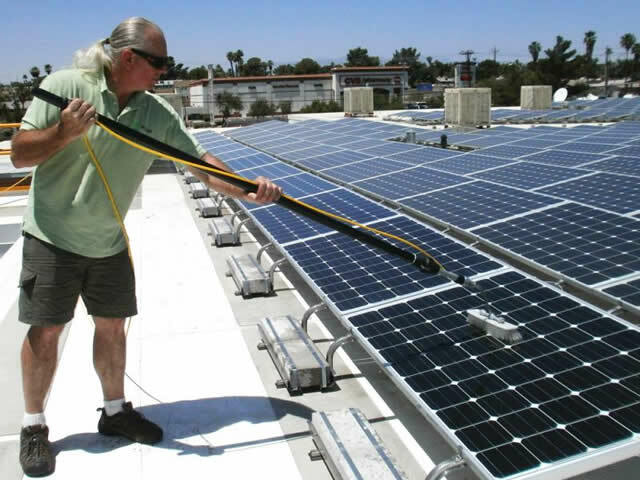 Most of the top quality solar panels approved for sale on the Australian market are well suited to be exposed to the elements and harsh weather conditions, even so, nothing can stop dust and dirt from building up on the glass surface that protects the silicon wafers inside the solar panels from water and the elements. When dust builds upon this surface, it will restrict the amount of sunlight reaching the modules resulting in lower system performance. The cure for this is pretty simple, clean the glass on the panels. Again let's take a safety-first approach, working at heights on a roof is dangerous, add water to the mix and you increase the danger with a wet slippery roof surface, add soapy water, and you increase the risk of slipping even more. Extreme care should be taken when cleaning solar panels on roofs, don't underestimate the dangers of working at heights. When working on roofs, there is a risk of falling. NEVER climb on a roof to perform any service on the solar modules unless there is a barrier to prevent you from falling or you are wearing an approved safety harness. If you have easy access to your panels and they are not too dirty, then you may be able to give them a simple wipe with some standard glass cleaner and a rag. This method is the safest with no need for hosing or water and the quickest as there is no need to squeegee or dry any excess liquid from the panels surface. For larger jobs and those with a much denser layer of dust or grime you will need to use soapy water, a long-handled sponge mop or soft brush will do the job, try to avoid hard brushes or scouring pads as they may scratch the surface of the glass. After giving the surface of the panel a scrub rinse off with a hose or fresh water then dry the surface with a chamois or squeegee, it is important not to leave the glass wet to dry on its own as water heavy with minerals can contain glass etching particles such as calcium which can permanently mark glass surfaces. As a precaution against causing any damage to the electrical components and wiring to take care where you point the hose. 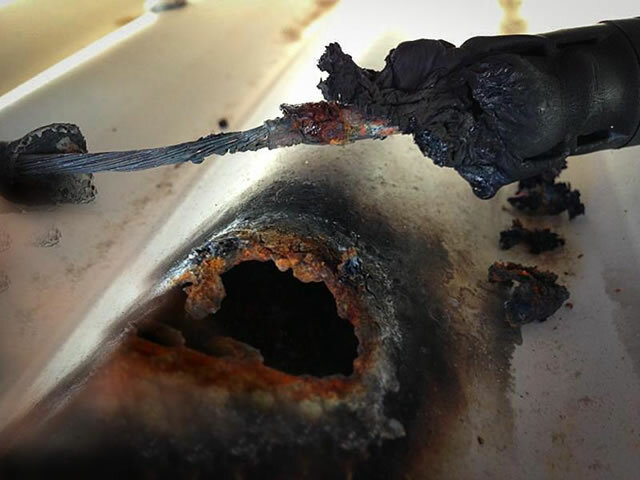 Do not squirt water directly on to any electrical connections or junction boxes; they should be well sealed however water under pressure from a garden hose can force its way into places where normal rainwater would not usually penetrate. 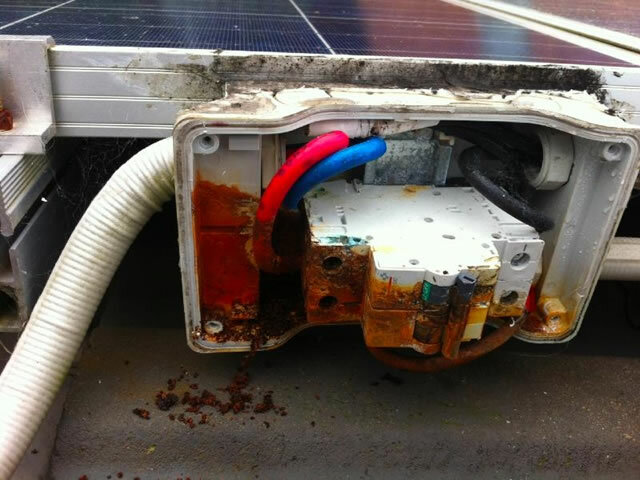 Some systems may have micro-inverters installed, these are usually mounted underneath the solar panels to try and gain some protection from the elements, try not to get them wet as well, they should be well sealed but why risk it. If you must use soap or detergent stay away from things like laundry soap or dishwashing liquid as these types of soaps can be highly corrosive to some metals, a small amount of car wash is a better choice. Solar panel cleaning in progress. 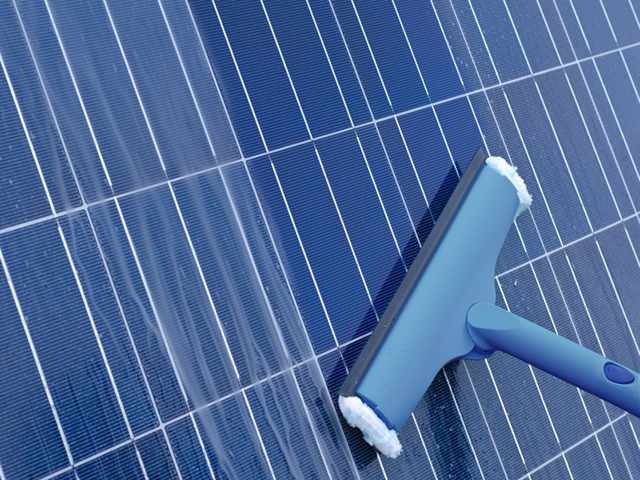 Solar panel drying with squeegee. If you are up on your roof cleaning your solar panels then now is the perfect time to do a visual inspection, a rooftop can be a harsh place for even the best UV resistant plastics and PVC ducting, once the outer protection of wiring starts to disintegrate then it's not long before a short circuit occurs. The integrity of all solar panel mounting frames, brackets, nuts, bolts & clamps. Grab hold of the panel and give it a firm shake, should be rock solid. Wiring and cables for splits, cracks or perished insulation & exposed wires. Any rubber grommets and waterproof seals on connectors & junction boxes. Look for holes or gaps in your roofing that may leak in the rain. Make sure everything is plugged in, look for loose ends or melted burnt plastic. 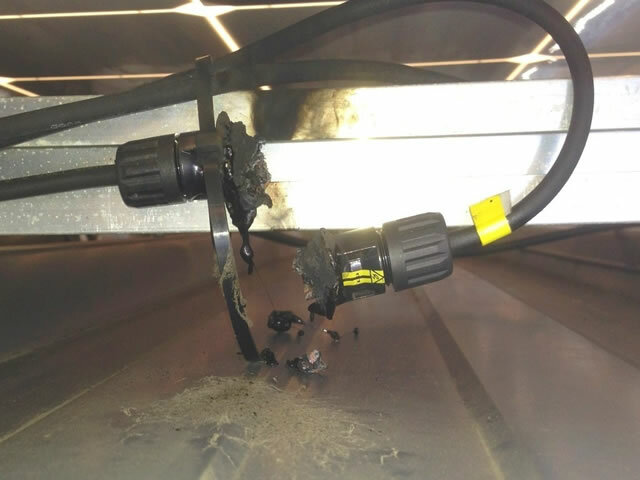 If you do find something that does not look right especially with the electrical cabling do not attempt to fix it yourself, call your solar power company or a licensed electrician. You may still be covered by warranty. Pictured below are some examples of what can happen when parts fail, be it caused by poor quality workmanship or wear over time you don't want to end up with these kinds of faults on your roof so if you can spot them before they occur that's a good thing. Failed cable and resulting damage.